Luton Town have made their second addition of the January transfer window by signing midfielder George Moncur from promotion rivals for an undisclosed fee. The 25-year-old, who started his career with West Ham United, has signed a two-and-a-half year contract at Kenilworth Road, although the Tykes retain an interest in his future. Moncur had loan spells at AFC Wimbledon, Partick Thistle and Colchester United during his time at Upton Park, leaving the Hammers to join the latter on a permanent basis in 2014. He netted 23 goals in 97 appearances for the U's, snapped up by Barnsley ahead of their first season back up in the Championship in the summer of 2016, where he went on to play 78 times, scoring nine goals. 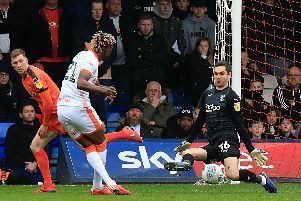 Moncur starred against the Hatters at Oakwell in October, providing an assist for Cameron McGeehan to score the second goal in their 3-2 win, running the show at times, had played 22 times this season, with just 11 starts. Interim manager Mick Harford told the club's official website: "George is a player who’s been on our radar for a long time. "When he was at Colchester he was on our radar, but he went north to Barnsley, and we monitored him. "Now he’s become available we thought it was an opportunity we couldn’t miss to bring him on board. “He definitely suits the way we want to play. "He can play a number of positions in the diamond – left, right, number ten – and if we ever went to a 4-3-3 or a 4-4-2, he can play left side or right side, so he’s very flexible attacking player, which we are just a bit short of at the moment. “He’s an exciting player and I watched the game on Sky earlier in the season from my hospital bed. "Barnsley were exciting that day, especially in the first half, and George played well in that. “We try to improve the squad with every player we bring in. He’s not coming in as a supplement, he’s coming in to hopefully play and make a massive contribution towards the end of the season. Gauthier Ganaye, the Tykes' chief executive admitted the club agreed to the deal with Moncur's contract running out in the summer. He said: “We have been in discussions with George’s representatives for a while, but it became very clear that he was not willing to sign a new contract. "With six months remaining on his deal, it means you have to make a decision on his future. "As well as that, he did not feature much over the course of the season, so this is a good deal for the club and the player. Moncur, who will wear squad number 20 and is available to face Peterborough tomorrow, said: “I’m over the moon to be here. "I’ve been up north for the last couple of seasons, away from my friends and family.